Version 4 of Winnipesaukee/Garmin is now available. Go to http://bizer.com/garmin for the latest progress on Bizer's Garmin project. *** We now have Garmin DataCards, SD cards, or MicroSD cards pre-loaded with our Winnipesaukee version W4. Bizer has increased its $100 REWARD to $250. Bizer's goal is to find and chart EVERY shallow area of Lake Winnipesaukee. If you can find a place that's less than six feet deep that Bizer has failed to mark in blue, Bizer will give you a reward of $250.00. The six foot depth is based on a fall lake level of 503.1 feet. During periods of lower-than-normal water levels (e.g. summer of 1999), the depths must be adjusted. Bizer backs its depth information with cash. The only guarantee that Duncan Press makes is: if there is a problem, they will replace the chart. Bizer offered a reward of $100 from 2001 to 2005 when Bizer's reward was increased to $250. Since 2002, Bizer has given four boaters a total of $850 for correcting Bizer's chart. No correction to Bizer's map is too small. We don't care how trivial it is. Maybe you know of a new No Rafting zone. Maybe you know of a restaurant accessible by boat that recently opened (or closed). Maybe you know of a new road that's not on our chart. Maybe you know of a new cell tower (or other prominant object on land) that is visible from the lake. (Some people navigate by taking bearings on land objects). email us at winni@bizer.com. We really do want to make this a perfect product. With your help, we might just do it. 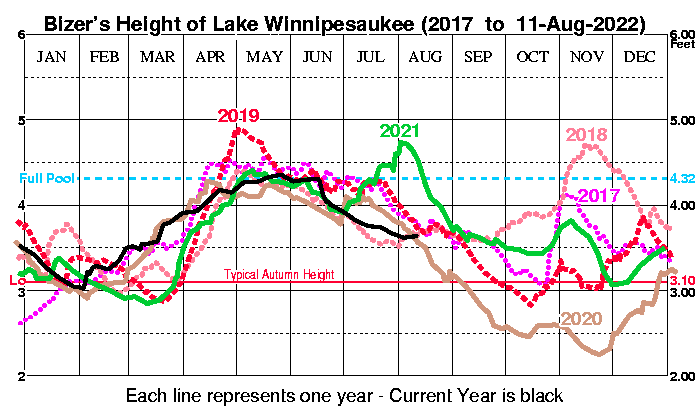 Lake Winnipesaukee's surface level is measured in feet. Readings are made daily by the New Hampshire Department of Water Resources. The datum (zero point) is 500 feet above sea level. Median heights are based upon data from 1984 through 2011. As a rule of thumb, assume: High Tide: June; Low Tide: February. Temperature, (F), readings are taken at the Lakeport Dam about one foot below the surface. The below historical statistics are updated periodically: normally weekly or whenever the lake level changes unexpectedly by more than three inches. Click here for NH DES graph of the last two weeks. The flow is the amount of water leaving Lake Winnipesaukee at the Lakeport Dam. It is measured in cubic feet per second (CFS). To put this in perspective, 1920 CFS is enough to fill about 45 swimming pools each minute. For a period of 24 hours, 1920 CFS yields 1.24 billion gallons, or enough water to lower the level of Lake Winnipesaukee one inch. The flow fluctuates depending on the time of year and the lake's height. The long-term average is about 550 CFS. Bridge heights reported on Bizer's chart assume a full lake level of 4.3 feet. To calculate today's bridge clearance for any bridge on Lake Winnipesaukee, add 4.3 feet to the height shown on Bizer's chart. Then subtract the most recent lake surface-level reading to obtain the actual clearance of any bridge. For example: to compute the clearance of the Long Island Bridge on 17-Apr-00, add the published bridge clearance (7.7 feet) to the full lake reading of 4.3 feet to get a subtotal of 12.0 feet. Now subtract the April 17th surface-level reading of 4.1 feet to get the actual clearance of 7.9 feet. If any of these changes might affect your navigation of Lake Winnipesaukee, Bizer suggest that you copy the relevant changes to your own chart for reference while navigating. Aug-2018 - On all Bizer's charts since 1996, Bizer states "The maximum speed in a NO WAKE area is six miles per hour." In future versions, Bizer's chart will state the complete law: "The maximum speed in a NO-WAKE area is 6 miles per hour or the slowest speed that a boat can be operated and mintain steerage way." Mar-2018 - This only applies to Bizer's waterproof (not laminated) version of Winnipesaukee. The back of the chart has map enlargements of the areas near public docking facilities in Alton, Center Harbor, Meredith, Weirs, and Wolfeboro. Someone noticed that many of the restaurants shown on the back have closed their doors or been renamed. See Bizer's web page for a more-current list of places to eat by boat. Feb-2018 - The lone red-and-white spar buoy 400m (1/4 mile) northwest of Sawyer's Point (800m north-northeast of the Graveyard) has been removed and will not be replaced. It marks an eight (8) foot depth (as depicted on Bizer's chart) which has been deemed not worthy of a buoy. Jan-2018 - The private airport in Melvin Village (Grid A7) has been deleted as it no longer appears on aeronautical charts. 2016 - For those of you asking what happened to Bizer's 10th edition, that edition was printed in paper only for wall mounting. Only those ninth edition corrections discovered after June, 2015, need be applied to the tenth edition paper chart. Additions & corrections to Bizer's ninth edition (March 2012) Winnipesaukee chart. Any changes dated 2014 or earlier have already been incorporated into Bizer's 10th edition. 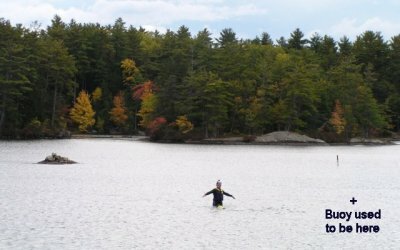 Oct-2015 - There is a previously unmarked shallow area in Moultonborough Bay. Bizer attempts to chart all areas less than six feet deep with blue tint. The following, five foot depth was discovered by a SCUBA diver in 2015. It should not be a problem to anyone with a draft less than four feet. East of Twin Islands and just below the "d" in the word "Islands" is a black-and-white buoy as depcited on Bizer's chart. A rock at a depth of five feet was discovered 45m (150 ft) ENE of this buoy at GPS coordinates N43�-41.089' - W071�-19.060'. Oct-2015 - ENE of Stonedam Island is Tommy's Cove. On the north side of Tommy's Cove, Bizer depicts two rocks. One of these rocks is marked by a buoy. Prior to 2005, the other rock was also marked by a red-and-white buoy. That buoy has been replace at N43�- 38.225' - W071�-25.687'. Aug-2015 - There is currently a dispute as to the exact location of a NO-RAFTING ZONE in Winter Harbor, Tuftonboro. This is due to ambiguous wording in the 1998 ruling of that regulation. Please ignore the No-Rafting Zone on the north side of Tuftonboro neck as it appears on Bizer's chart. All Bizer can say is that it lies somewhere northwest of flashing light #15. Bizer has written the Commissioner of Safety for a re-write or ruling. This should be clarified by 2016. Mar-2015 - This correction applies ONLY to the electonic chart of Winnipesaukee for Garmin devices: About 100m (350 ft) south of Ledge Island (northeast of Stonedam Island) are three navigation buoys. From west-to-east, is a black-and-white (BW), a red-and-white (RW), and another Black-and-white. Between the RW and the easternmost BW is a rock just below the surface. This rock is depicted on Bizer's paper chart in the inset on the left side of the paper chart. This rock was not depicted on Bizer's electronic chart for Garmin devices. This rock will be depicted on all Garmin electronic charts issued in 2015 (Version 9). Boaters should pass east of the easternmost BW buoy -or- west of the RW buoy, as depicted on Bizer's paper chart. Akwa Marina, about 0.4 miles northwest of Weirs Beach, has a restaurant and a convenience store open to the public. Transient docking is available. Oct-2013 - In Paugus Bay, there used to be two black-and-white buoys southeast of Big Island. The one nearest Big Island was missing in 2011 and 2012. It was replaced in 2013. Add a black-and-white buoy at N43�-34.316' - W071�27.692'. This is about halfway between the northern tip of Big Island and the existing black-and-white buoy depicted on Bizer's 9th edition. Jul-2014 - Omitted NO-WAKE buoy: There are two black-and-white buoys west of the Long Island Bridge, just south of Trexler's Marina. The westernmost of these two buoys (the one nearest flashing buoy #62) has a NO-WAKE buoy as a companion buoy. Due to at typographical error, the NO-WAKE buoy is not depicted on Bizer's 9th edition. Feb-2014 - The black-and-white buoy on the north side of Sandy Island, which has been missing for two years, will not be replaced. The buoy was close to shore and marked a rock that was more than six feet down. Feb-2014 - At the western end of Moultonborough Bay there were three black-and-white buoys aligned north-to-south. The middle of these three has been missing for two years and will not be replaced. Feb-2014 - There used to be a red-and-white buoy about 80m east-northeast of light #56 at the lower end of Paugus Bay. This buoy marked the intake for the Laconia water supply. It did not mark a boating hazard. This buoy has been decommissioned. When the companion buoy at light #56 changed from black to red a few years ago the traffic pattern changed. Boats no longer approached this red-and-white buoy. Feb-2014 - The easternmost of three black-and-white buoys off Dockham Shore Road in Gilford has been decommissioned and will not be replaced. Feb-2014 - There is a new no-rafting zone. The area north and northeast of Ledge Island in Meredith, which includes three coves, is now a no-rafting area. Ledge Island is northeast of Stonedam Island. Feb-2014 - Currently there are three No-Wake buoys near Meredith center. These will be adjusted slightly and a fourth No-Wake buoy will be added in 2014. This is in response to a few boaters who failed to notice the No-Wake buoys as they approached the Meredith Docks. Feb-2014 - The lone buoy at Ellacoya State Park will be removed. Feb-2014 - The red-and-white buoy in Greens Basin will be moved about 100m north. It will be returned to its pre-2001 location to mark a submerged rock. In this photograph, the camera is facing south. There is a man standing on the submerged rock holding his hands up for balance.